Are you already planning your summer vacation? The new Google Earth updates can help you map out your plans. We've added roads in 58 countries in Africa, 32 in Asia, and 4 in the Caribbean -- now both Maps and Earth provide the same roads coverage. We've also launched business listings layers for Brazil and a few cities in Russia to help you find the right restaurant or bank, for example, in case you crave a special type of food or you run out of cash. And traveling through Russia is even easier, thanks to the fact that the balloons have Cyrillic or Latin-transliterated addresses (depending on the language of your desktop), so now you can read and pronounce your hotel's address. The New Zealand tourism board also provided Google with detailed information on New Zealand airports, so planning a trip to Kiwi Land is easier than ever. 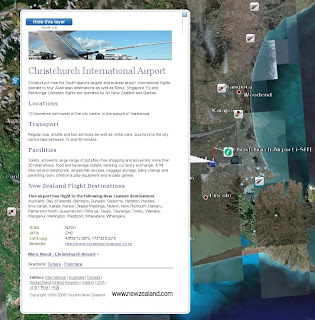 You'll find the New Zealand airports layer under the New Zealand Tourism layer group inside the Gallery folder. 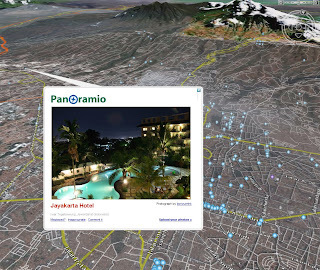 And last but not least, virtually fly to your destination and read interesting new Wikipedia articles and look at new Panoramio pictures. You have the choice of over 4 million pictures worldwide, with more added every day.